This project was finished last year. It was a kit with 14 count clear plastic canvas (110 x 65). I like the design. It does not take many colours (only 13) but the result is so vivid. The butterflies look real. 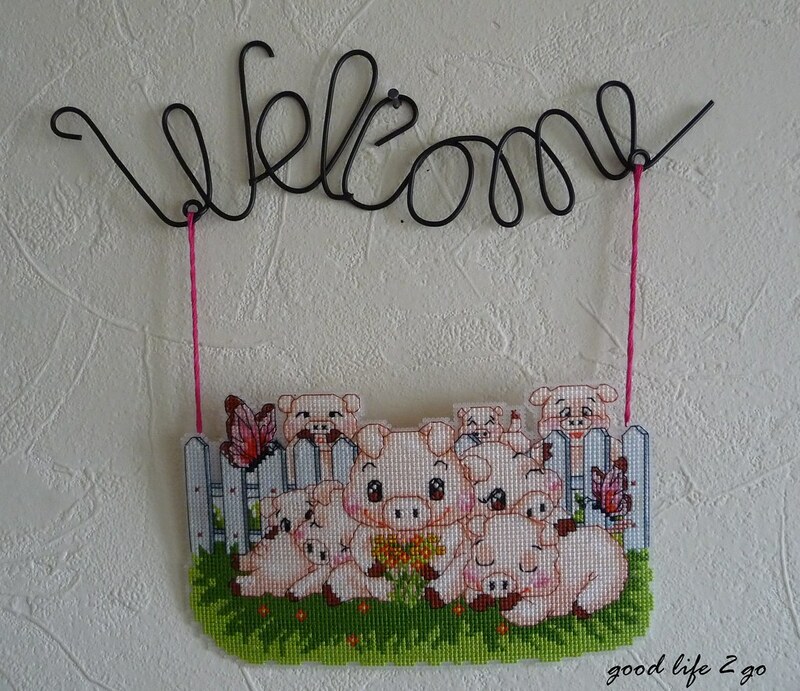 I hang this on the wall next to the front door to give a warm welcome, to the guest and ourselves too. Now my concern is how to clean it when it gets dusty. Can anybody help please? We had a holiday in North Wales this summer. It was The Sun holiday offer and only cost us £60 for 3 nights weekend stay with a three-bedroom chalets. Then we spent another £20 for an extra night. This was the 4th or 5th time we went to Wales. We always found new places to go and did enjoy the time. We did this photo after a heavy shower. We drove a long way to follow a 'local crab' sign. Unfortunately, there was no fresh live crab available. But luckly, the seller loves birds. There were so many different birds. What a life! 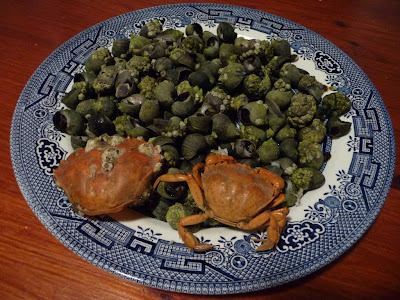 Finally, I show you my mouth watering catch - whelks and crabs. It was a low tide. I caught them just in front of the holiday park. 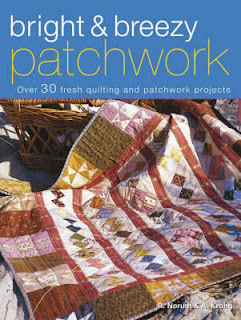 Bright and Breezy Patchwork - Over 30 Fresh Quilting and Patchwork Projects by R.Norum & H.A. Krohg. It is a good book for both beginners and advance patchworkers. It starts with basic patchwork knowledge, including materials, equipment and techniques, to give the beginner a practical start on patchwork. The book covers both large and small projects, from bags and kids accessories to full-sized quilts, all with clear step-by-step instructions for readers to follow. At the end of the book, there are some templets provided. This is a book for quilters and sewing enthusiasts to dip into again and again. 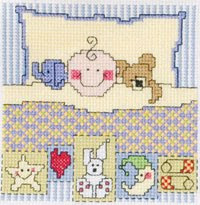 Today I found a good website about cross stitch finishing instructions. Write it down here for the future use and also share with you. 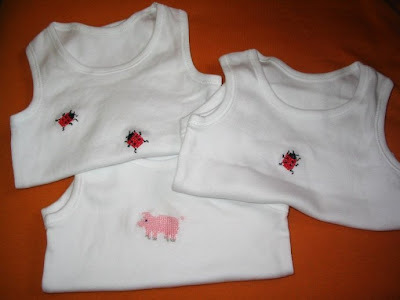 I did these baby vests cross stitch last year before my daughter was born. It is very easy and takes a little time. I used the aida left from the previous project. Firstly I attached the aida on the vest by stitching the edge. 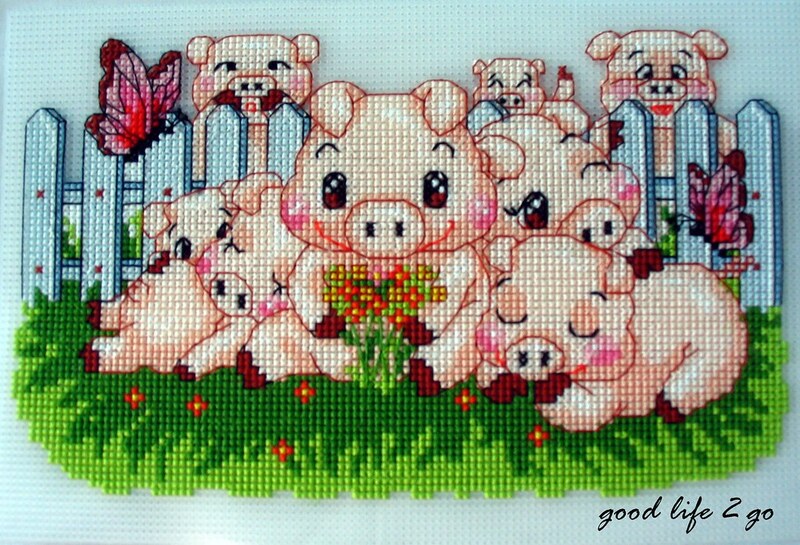 After finishing the ladybirds and the pink little pig, I took out the aida line by line. The normal vests turned to be designer clothes right away. The only problem is that the back stitches might a bit rough for the baby's tender skin. But my daughter did not seem to be bothered.